If Conan O'Brien can learn the Jack Dagger Method in less than 5 minutes on live television, you can too! Finally, an instructional video that is guaranteed to teach you the simplest, most effective throwing system ever! Or your money back! Just follow the 4 easy steps that make up the system and you'll be on your way to sticking any knife from any distance in no time at all, thanks to. . .
By World Champion and Professional Knife Thrower; Jack Dagger. "You got some great moves, kid." - Adam Sandler to Jack Dagger after working together on You Don't Mess with the Zohan. 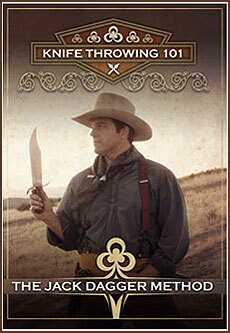 Jack Dagger is Hollywood's go-to guy for knife throwing instruction and performance. He's a Champion Speed and Tomahawk thrower and was given the National Knife Throwing Entertainer of the Year Award 3 times. Get ready for the DVD that teaches you what you need to know to throw like a pro! Learn what 4 steps make up the simplest, most effective throwing system ever! Find out what the Seven [most] Frequently Encountered Problems (FEPs) are and how to avoid and fix them. Competition throwing, target and backboard construction and proper knife selection are also covered. Keep reading to find out how you can be part of the fastest growing target sport in the world! And you'll even get to see part of Jack Dagger’s professional act! The Secrets of Knife Throwing Revealed - "It's Simple!" If you want to learn the insider SECRETS, TIPS and TRICKS that the pros use to hit their mark every time, at any distance, then Jack Dagger's "Knife Throwing 101" is for you. According to Jack there are only 2 reasons a knife doesn't stick. It either over rotates or it under rotates. Learn the 7 [most] Frequently Encountered Problems (FEP's) of over spinning and different methods of correcting them. You'll also learn the 2 reasons your knife will hit the target under spun, either from 'over gripping' the knife or 'soft pawing' it. Jack teaches knife throwing as a fun, safe and confidence-building exercise for students of all ages. This video will guide you step-by-step, from choosing a throwing knife, through the basics that will get you hitting the target, to the details that will help you fine tune your throwing to gain consistency and accuracy from any distance. For a limited time, you can have the ultimate knife throwing DVD for only $24.95. By acting now, you'll save nearly 30% off the regular price of $34.95. "Step right up and get your copy soon they are "Flying" out the door at record speed! If there is one goal you want to "stick" to this year pick up a copy and you will reach your goal in record time!" You've just got to see it to believe it!
" Very user friendly. Chris was uber inspired to go out and try it. If we weren't in the starving artist business he'd probably be slinging knives as we speak. You've got fantastic public speaking skills and I imagine you'll be an amazing father one day because your teaching methods are superb. You come across as wise, gentle, personable and funny. I imagine anyone could pick up this dvd and go out right away to start practicing. Easy to follow. Never even remotely confusing. Clear concise instructions and it wasn't too long. Over all, loved it, and laughed a lot. If I had sharp pointy stuff I'd be up in the hills slinging instead of typing right now. And we can't forget about the most amazing stunt of all... The Jack Knife - Cucumber Slice (as seen on The Tonight Show with Conan O’Brien) which only Jack can do! All with a full year, 100% money-back guarantee! "Very thorough and fun! The best knife throwing instructional video I have seen to date. Highly recommend it!" That's nearly 30% off the regular price! The regular price of Mr Dagger's DVD is $34.95. But for a limited time we are offering it for a discounted price of only $24.95. Is enjoying your free time worth $24.95? To put it into perspective, the price of this instructional DVD is less than the price of dinner for two at an inexpensive restaurant. While it costs slightly more than your average music CD or video, the fun that you, your friends and family will have continues on and on after that! It's a DVD that you'll watch over and over again getting something new out of it every time, and that's value! Think about it in terms of the potential for you, your friends and your family to have fun. Its a great hobby to get involved in. Its mildly aerobic, a great way to relieve stress, its a fantastic way to spend time with your friends and family... and its just plain fun!!! We don't want you to take our word for it. We'll guarantee it, with a risk-free, money-back guarantee. You can take a full year to watch this simple, but effective instructional video. If you don't feel the video has delivered everything we promised, then we don't want to keep your money. Simply return the tape with a note asking for a refund. You'll receive your money back (minus shipping) with no questions asked. You'll have nothing to lose, and everything to gain. Procrastination is the number one killer of success. Most people fall victim to it and put off even the best opportunities. Those are the people who will continue to struggle week to week, month to month. A year from today, they will still be struggling -- wondering why success has eluded them. With our full-year, 100% money-back guarantee, you can't lose. If you feel the product didn't meet your expectations, you'll get your money back -- no questions asked. So you can't lose by taking action today. The only way you can lose is if you let procrastination win out. Join the thousands of throwers who already have this "Fundamentals" Video and start having fun in your backyard today! Special Discounted Price: $24.95 Plus S&H! P.S. Act today and you'll save almost 30% off our regular price. You have no risk with our full-year, 100% money-back guarantee. Don't put it off.